I recently made a three-hour journey to the magical land of Fairfax, CA to receive bee venom therapy, also known as apitherapy. There has been an incredible amount of curiosity about my experience, so I decided to devote a blog entry to it. I wasn’t engulfed by a cloud of bees and stung until I screamed for mercy like some of you might have imagined. Sorry to disappoint you! To my relief, it was actually pretty mild compared to some of the dramatic needle experiences I've had lately. I’ve been feeling like a pincushion doll for the last 6 months due to my stage 3 breast cancer diagnosis in September, 2016. Ever since reading 'The Fifth Sacred Thing' by StarHawk twenty years ago, where bees play a prominent part of a future civilization, I have been intrigued by bees. Not only are these sacred insects an important part of our ecosystem and are essential for our survival as a human species, but they also have a fascinating consciousness. Bees are responsible for much of the food on your plate. They perform a task that is vital to the survival of agriculture: pollination. In fact, bees pollinate one-third of our global food supply. Simply put, bees keep plants and crops alive. Without bees, humans wouldn’t have very much to eat. To put this into context, these are many of the crops pollinated by bees: Almonds, apples, apricots, avocados, blueberries, cantaloupes, cashews, coffee, cranberries, cucumbers, eggplants, grapes, kiwis, mangoes, okra, peaches, pears, peppers, strawberries, tangerines, walnuts, and watermelons. Without bees, these crops would cease to exist. Bees are crucial to our existence as well, thus we must work harder to protect and preserve them. So perhaps connecting with the bees helps us to remember an ancient lineage we’ve forgotten? Apitherapy or “bee therapy” (from the Latin apis which means bee) is the medicinal use of products made by honeybees. 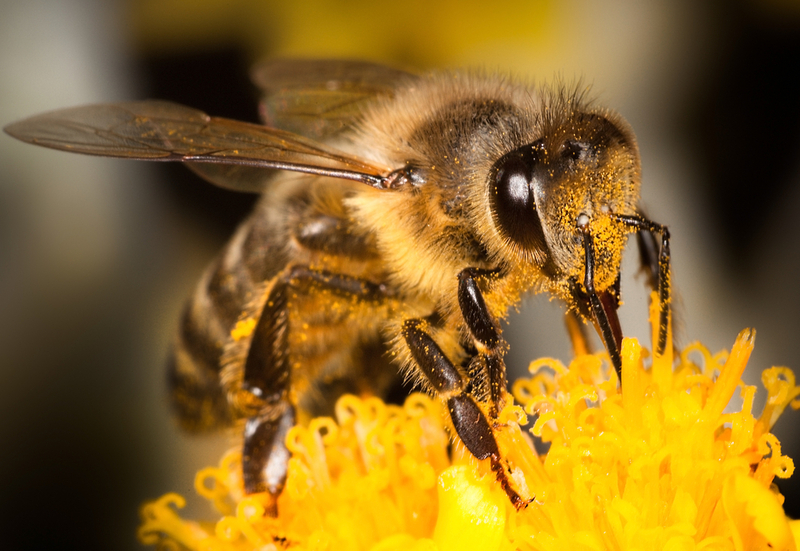 Products of the Honeybee include bee venom, honey, pollen, royal jelly, propolis, and beeswax. Some of the conditions treated are: multiple sclerosis, arthritis, wounds, pain, gout, shingles, burns, tendonitis, tumors, and infections. After a long three-hour drive it was lovely to arrive at her beautiful health clinic. Tamara started out by feeling my body for signs of congestion. Due to my intensive health routine, I undergo massive detoxification at times. As the cancer dies off, the liver must process the dead cells and that creates congestion. (There is also a strong connection between breast cancer and the liver in Chinese acupuncture.) Through manual manipulation, she physically released some of these tight spots before inserting the acupuncture needles. Once the needles were placed it was time for the apitherapy. Tamara is highly experienced and even has a fifteen-hour course she offers. Please see: Apitherapy Course I implicitly trust her and her wisdom. Since this was my first experience, she had explained that we would be taking a conservative approach and only a small amount of the bee venom would be used, like a homeopathic dose. In a normal bee sting, a bee will inject all of its venom, which would have been an overdose in my case. A small dose makes it easier for the body to process and use it as medicine. From what I understand, many apitherapists let the bee lose its stinger, which causes the bee to die. Tamara has a different approach. Gently holding the female bee with tweezers, she brought it near my breast and the bee gently inserted the stinger near the tumor. It was so quick that the bee didn’t lose it’s stinger! Before I knew it I felt a small amount of venom enter my system. Compared to all the needles I’ve been stuck with for blood draws and high dose Vitamin C infusions that take hours, the noxious fluids I drink that taste like dirty socks and all the discomfort I’ve experienced due to my healing protocol, an easy and painless, venomous prick from a controlled, gentle bee was a breeze! I loved how Tamara gave each bee the choice of whether it wanted to sting me or not. If the bee was placed next to my skin and didn’t elect to sting me, she would get another one. She had the utmost respect and cooperation with her bee allies and it was fascinating to hear the enchanting buzz of the bee before it stung me. It was like a remembrance of sorts, a calling to my soul of age-old medicine, mystical, and magic. I was stung right over my tumor and two other spots around my breast where she felt liver congestion. After the venom slowly entered my system, I fell into a deep, rejuvenating slumber which is the blessing of acupuncture needles. I passed out for 30 minutes but it felt like I had slept for eight hours. I woke up feeling rejuvenated! Tamara said that my body received the venom well due to how fast it was absorbed. Welts or inflammation can occur if there is a rejection of the venom. I'm doing so many different procedures now that I never really know how my body will react. I've learned not to have expectations and just allow my body to flow with whatever medicine I am taking. Learning to have a fluid schedule and canceling plans is not uncommon for me, it’s become necessary to respect whatever my body needs in the moment. I was surprised at how much energy I had post venom experience! I thought I might be exhausted, nauseous, or dizzy afterward, which are common reactions I have to certain medicines. On the contrary, I was energized and went for a long walk to town to eat, saw a movie with my beloved, and actually felt like a ‘normal’ human being for an evening. Having a health diagnosis like this turns everything upside down and life is suddenly organized by medicines, doctors appointments, tests, procedures, and all about healing. Bee venom is potent medicine and as I see it, it's a viable and powerful form of healing for all kinds of maladies. I am actively pursuing ways to receive bee venom therapy at my home in Nevada City, CA. Since Tamara lives almost 4 hours away it's not practical to see her regularly so I'm researching ways to self-administer the venom and I'm considering having a small hive myself. The esoteric healing power and wonder of the bees has captured my attention, and I am listening. Can you hear the buzz?